How much does it cost to travel to San Francisco? How much money will you need in San Francisco? $172 is the average daily price for traveling in San Francisco. The average price of food for one day is $32. The average price of a hotel for a couple is $206. Additional pricing is in the table below. These average travel prices have been collected from other travelers to help you plan your own travel budget. How much money do I need for San Francisco? San Francisco is a beautiful city that is famous for it's picturesque neighborhoods, liberal character, and stunning location on the bay. 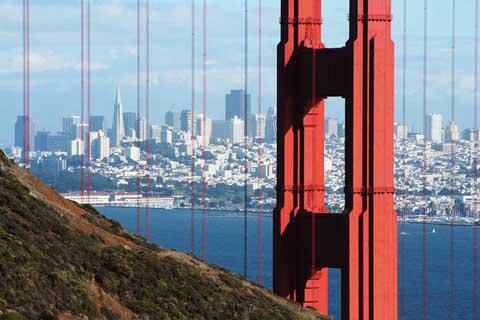 Some people describe San Francisco as the United State's most "European City." This title most likely comes from its compact development and its easy walkability. It also has no shortage of parks and public spaces where you can pass some time. The city sits on the end of a peninsula and offers stunning views of the blue bay, rolling green hills, and the striking Golden Gate Bridge. San Francisco's climate is notoriously cool and foggy. The winters are damp while the summers are dryer but surprisingly chilly. Throughout the course of one day you can expect a variety of weather changes. Summer mornings often start with fog. Afternoons are warmer, but the chill and fog return again by the late afternoon. Winter is the rainy season, but temperatures are milder and sunny days may even have a warmer temperature than during the summer. Fall is a great time to visit because the fog is not a frequent and the rains have not yet arrived. San Francisco also has many microclimates that are created by the city's hills and coastal setting. It is not uncommon for one neighborhood to be experiencing dramatically different weather than another. Sights throughout San Francisco are plentiful. Some of the most famous places to visit in the city include the Golden Gate Bridge, the Palace of Fine Arts, Coit Tower, the Transamerica Pyramid, the Piers along the water, Lombard Street, and the Painted Ladies. The Painted Ladies are a beautiful series of Victorian Row houses made famous by the San Francisco based sitcom, Full House (and you can see them at Alamo Square). Some of the best parks in the city include Golden Gate Park, Lincoln Park, Mission Dolores Park, Baker Beach and China Beach. San Francisco is a city of neighborhoods. Each has its own character and personality. Union Square and the Financial Districts are notable with tourists as this is where you'll find many hotels, shopping areas, and some entertainment. Fisherman's Wharf is also a popular area with tourists. It sits on the waterfront and has many famous sights such as Pier 39 and Ghirardelli Square. Nob Hill is a notoriously upscale neighborhood, and from the top of the hill you can get great views of the bay and the financial district. Haight Ashbury is the crux of the "hippie's" movement, although today it is little more than a tourist attraction. Golden Gate Park is also a wonderful place to explore, and Chinatown is a fun place to walk around and try dim sum dumplings. Other neighborhoods that tourists frequent include North Beach, Castro, and Twin Peaks. San Francisco is a large and vibrant city. It has no shortage of activities and events. There are boat tours of the bay, as well as concerts, shows and festivals throughout the year. Popular festivals include the Haight Ashbury Street Fair, Chinese New Year, San Francisco Blues Festival, the International Film Festival and Bay to Breakers. With plenty of fun and unusual activities to do in San Francisco, you'll quickly learn why this city on the bay has earned its quirky reputation. Food in San Francisco is wonderful, and you'll have any number of international options throughout the city. There is no shortage of Asian restaurants. Specifically, Thai, Chinese, and Japanese are quite abundant. If you're looking for some great meals at a reasonable price then avoid eating in the Union Square and Fisherman's Wharf neighborhoods. These restaurants are overpriced and cater almost exclusively to tourists. Instead, head into some residential neighborhoods and you'll find some wonderful local restaurant options. If you're looking for good Mexican food, go to the Mission neighborhood which has some wonderful taquerias. San Francisco is a compact city so walking around is very appealing. Many people are surprised at the steepness of the hills, so if you hope to cover any significant distance, plan your routes around hills wisely. Public transportation is readily available in San Francisco, although it can be somewhat inefficient and frustrating. The system tends to be overcrowded, particularly if you're traveling during peak hours. There are several different modes of transport including the subway, streetcars, buses, trolley buses and cable cars. The Muni system includes the Metro subway, the buses, trolley buses and cable cars. The BART and Caltrain systems are regional and are not included in the Muni System. Taxis in the city can be expensive and inefficient. In general, it is best to plan your day around public transit. This will save you both time and money. Driving is also not recommended. Traffic can be frustrating and parking is expensive and difficult to find. There is really no reason to have a car in the city. Instead paying for buses and cable cars as you go, buy a multi day pass. The pass is good on all buses, trams, trolleys, and the cable car (which costs $5 one way otherwise!). If you plan to take the cable car at all, the multi day pass is the way to go! If you want the best dumplings in town, check out the Shanghai Dumpling King in the Richmond District (Balboa and 31st). It's cheap and wonderful!